Cartoon image courtesy of Mike Moreu and Fairfax Media. Cartoon image via television coverage of the House of Representatives. Here we have the Minister for the Environment listening intently to the Campaign Manager for the National Party but he’s obviously not listening to much else. 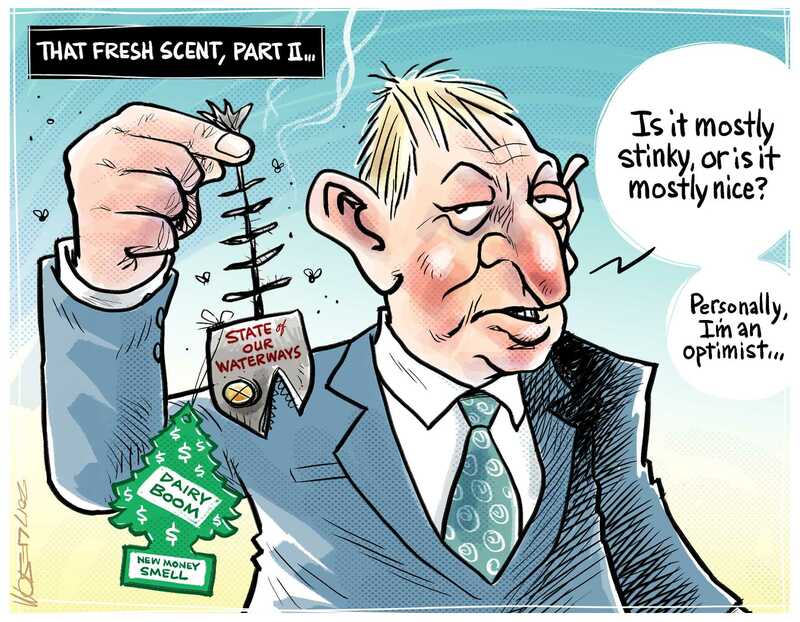 The majority of right-thinking Kiwis including academics, environmental experts and even those who maybe don’t yet fully understand what has actually happened to the Country’s precious fresh water but who know something stinks, are becoming more and more vocal about this pollution crisis. With an election looming up on September 23rd this year, National Party heavy-hitters must be thinking that even their most die-hard supporters are likely to be well and truly over the orchestrated litany of B.S. the Minister for the Environment continues to unashamedly spout. Amongst a raft of urgently needed remedies, the agricultural sector needs to be dragged, kicking and screaming into the real world real soon.